When Swiss cyclists look back and see a car overtaking them, they have good reason to be extra cautious. One in ten bike accidents happen when a vehicle is passing a cyclist, according to The Swiss Bicycle Advocacy Association, PRO VELO. 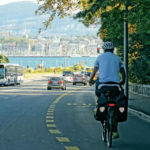 That’s why the group, meeting last weekend in Aarau, proposed that Switzerland adopt a law similar to those in France, Spain, Portugal and the U.K. Those countries say that a vehicle overtaking a bike must keep at least 1 to 1.5 m. lateral distance. PRO VELO wants cars to keep a minimum of 1.5 m. from them when they whiz by on Swiss roads. In a country of just over 8 million people with about 4 million bicycles, such a measure could save bruised knees, broken bones and lives, and increase bicycle use among young and old. A survey in 2016 showed two thirds of cyclists often feel they’re passed without enough distance. Another issue for cyclists is pollution. Cycling puts lungs close to vehicle exhausts. In 2016, researchers calculated a healthy cycling tipping point, the time after which cycling in pollution does more harm to health than good. Compared to sitting at home, the health benefits of cycling exceeded pollution health damage in most scenarios. However, when PM 2.5 concentrations reach 100 μg/m3, harm exceeded benefits after 1 h 30 minutes of cycling, according to the study. Background pollution rarely exceeds these levels in Swiss cities, although levels did in parts of Ticino in February 2017. 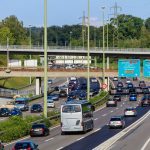 Street level pollution could be up to 31μg/m3 higher than background pollution, according to another study. So if the background level is 70 μg/m3 the level on the street could exceed 100 μg/m3. It would also presumably fluctuate as vehicles come and go. In any case, defining an acceptable level of pollution is a bit like coming up with a safe level of smoking. The Swiss government does not publish PM2.5 particulate concentrations, focusing instead on PM10 particulates. Their website shows PM10 pollution levels across the country. Creating separate cycle paths is one way to reduce accidents and keep active lungs away from vehicle exhausts. Last year, cycling advocates amassed enough signatures for a popular vote to change the federal constitution to elevate requirements for cycle paths to the same level as pavements for pedestrians. Most support came from Zurich and Bern where close to half the signatures were collected. The Federal Council rejected the initiative. Instead it offered to support cantons and communes to manage cycle paths and coordinate at a national level. What this would actually deliver remains unclear. 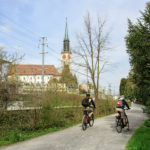 Christoph Merkli, PRO VELO director and one of the initiators said: “The commission’s decision shows that our initiative is justified and realistic”. At the same time the initiators think their original plan would be more effective than the one hatched by the Federal Council’s commission. To learn more about the bike initiative or PRO VELO, you can email their main office in Bern at info@pro-velo.ch. Or to join, just fill out this form. Membership is open only to residents of Switzerland.